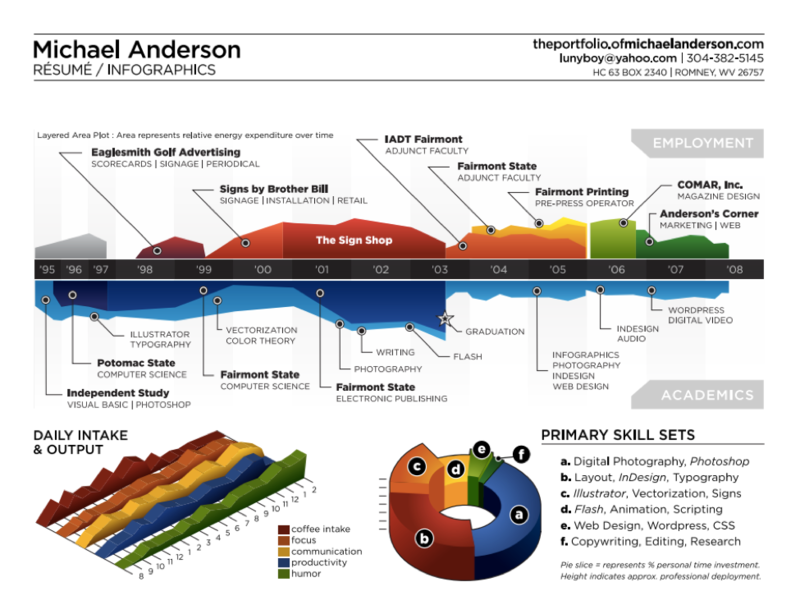 Version v0.1.0 of VisualResume is available on GitHub at http://www.github.com/ndphillips/VisualResume. The main function in the package is VisualResume(). When running VisualResume() you need to include several arguments that specify the content, size and location of the plotting elements. The function will automatically format the resume to fit your specifications. timeline A dataframe with columns title, sub, start, end, side. The title and sub columns are character, start and end are integer, and side is binary (0 = bottom, 1 = top). events A dataframe with columns title, year specifying important events (e.g. ; publications). interests A list of named character vectors specifying interests. The more often a value occurs in a vector, the larger it will be displayed. Here are some of the optional function arguments that will either add new elements to the plot, or adjust the attributes of existing elements. milestones A dataframe with columns title, sub, year specifying some milestones (e.g. degrees earned). titles.right.cex, titles.left.cex Numeric vectors specifying the size of the header titles. year.steps An integer specifying the step size between year labels. VisualResume() will do its best to put plotting elements, like boxes and boxes, in reasonable locations in the timeline. However, it won’t be perfect. In some cases, labels might overlap or just not look very elegant. If this happens, you can specify some plotting parameters in the timeline dataframe by including the columns box.x0, box.x1, box.y1, box.y2, which control the locations of the boxes, point.x, point.y which control the locations of the points, and label.x, label.y, label.dir which specify the locations and direction of the labels. See the help menu?VisualResume for additional details. To leave a comment for the author, please follow the link and comment on their blog: Nathaniel Phillips.